Archibald Cary Smith was born in New York City, one of six children of the Rev. Edward Dunlap Smith, a graduate of Princeton University, the University of Virginia and Princeton Theological Seminary. The family came from Philadelphia, Mr. Smith’s paternal grandfather being a prominent ironmaster. At the corner of Twentieth Street and Ninth Avenue, near his father’s church, stood in those days a pump. The would-be naval architect and his young companions were in the habit of damming the street and then manning the pump by turns until a pond was formed of sufficient size to float their miniature craft. 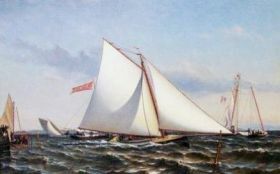 As a young boy, Mr. Smith was about the yard where the schooner America was building, spending his time at home in efforts to reproduce her in his small models. The desire to build vessels was so strong that he was finally allowed to go over to Pamrapo under the tuition of Captain “Bob” Fish. 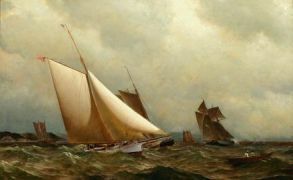 Under this capable instructor he mastered a good deal of the practical side of boat and small yacht building, of splicing, serving, and practical boat sailing. 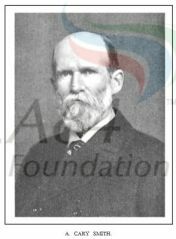 In the way of higher education in naval architecture he enjoyed one term, at a fee of $25, under Mr. W. W. Bates, one of the old school shipwrights, afterward Commissioner of Navigation. 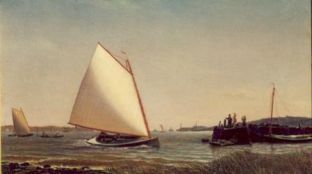 Early in his apprenticeship, Mr. Smith built the 18-foot sloop COMET, famous in her day and for long afterward, and later he was recognized as the best racing helmsman and handler of small yachts on New York Bay, no small honor in those days of keen racing. 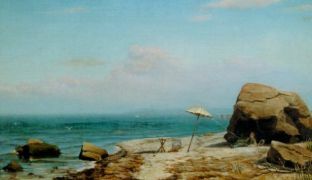 After a time, however, he abandoned both building and sailing, and took up the study of painting, his specialty being marine work and yachting scenes. 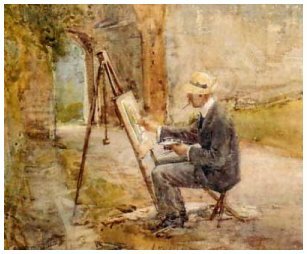 It was while thus engaged, with no thought of any other future than that of an artist, that Mr. Center returned from Europe. He determined to build a keel cutter of iron in place of wood, and sough Mr. Smith's aid. Marrett’s book, and its then new system of designing on paper by means of calculations and comparisons of elements, was carefully studied and the design of Musquito, an iron cutter built in 1848 on the Thames, was taken as a basis for the work; her lines being given by Marett. The design was made and the work of construction started early in 1871 at the shipyard of Reaney, Son & Archbold at Chester, on the Delaware River, afterwards Roach’s shipyard. 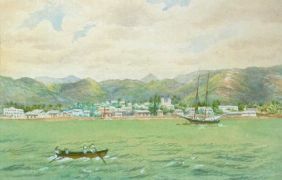 The new project met with opposition and hostility and every hand, from yacht owners, yacht builders and such practical seamen as yacht skippers, pilots and fishermen. 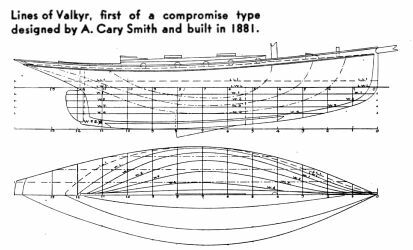 The type of vessel, so different from the shoal centerboard sloop of the day, was condemned as wrong in every way; it was confidently predicted that an iron vessel would sink like a stone, and the idea of planning and building a vessel without a model was ridiculed as absurd. VINDEX, as the boat was named, not only floated, but sailed. The experience with VINDEX started Mr. Smith on the career which he has since pursued so successfully; his work from that time being entirely after the now-accepted method of systematic designing and calculation. 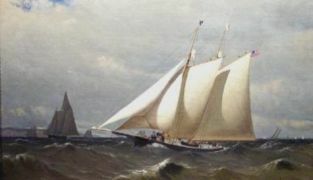 A. Cary Smith designed VALKYR, the first of the “compromise” type, built in 1881 by Johnnie Driscoll for Dr. B. F. Dawson. 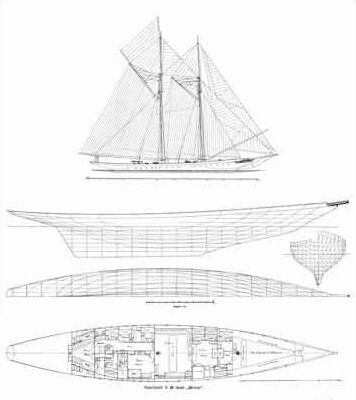 The lines show a marked departure from the current sloop practice, with the plumb stem, long fantail and sheer of the cutter, much greater breadth and a lead keel, plus a centerboard. The entrance is quite hollow. The rig was that of the cutter but with a laced foot to the mainsail. Her dimensions were: l.o.a., 57 feet 6 inches; l.w.l., 47 feet 4 inches, breadth, 15 feet; depth, 7 feet 1 inch; draft, 6 feet 8 inches. 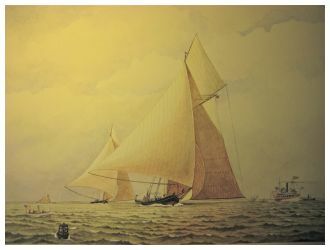 The work of A. Cary Smith includes every class of yacht from the smallest racing catboat up to large schooners and steam yachts; but his great success has been in his schooners. 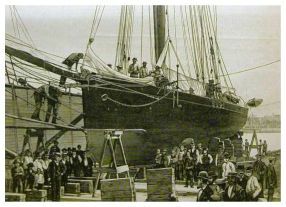 The first of these, PROSPERO, 1873, was a novelty in her day, INTREPID, built in 1878, and NORMA, a year later, marked a radical change of type in seagoing yachts. 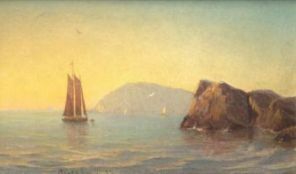 FORTUNA, IROQUOIS, ARIEL, LASCA and the auxiliary GENESEE, are all noted for their sterling qualities as yachts in which a man may go anywhere in safety and comfort. 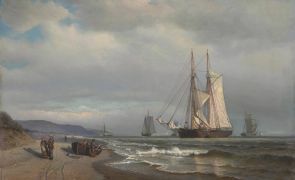 The largest of the schooner fleet, YAMPA, now Iduna, owned by the Emperor of Germany for the past three years, has just brought to Mr. Smith an order for a still larger yacht of the same type to replace her. 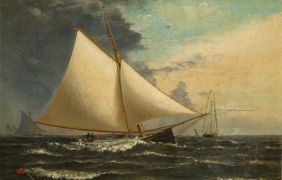 In 1879 Mr. Smith designed for the late J. H. Busk, an Englishman long resident in New York and with American ideas in yachting, the sloop MISCHIEF, of what was then called the “compromise” type. 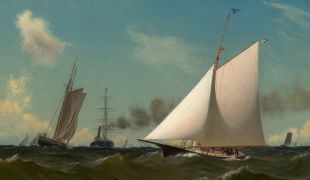 She had an iron hull, with less breadth and greater depth of body than, the older sloops of her class, retaining the centerboard; her ballast was of lead and stowed very low on the iron plating; her rig included the single jib and laced mainsail of the sloop, its proportions being a compromise between sloop and cutter, and her round pole bowsprit, housing topmast and masthead pendants and runners, with other details, allied her to the cutter. In December, 1884, there came notice of a challenge for the America’s Cup from Sir Richard Sutton, owner of the 80-ton cutter Genesta, accompanied by a similar notice from Lieutenant William Henn, R. N., owner of Galatea, a sister vessel. As Genesta was of 80 feet waterline and Galatea five feet longer, it became necessary to build at least one new yacht to defend the Cup; the largest existing single-stickers being Gracie and Bedouin. 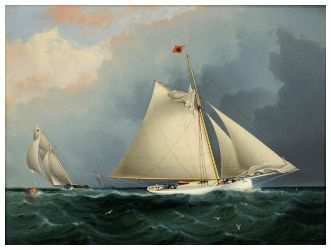 The commodore and vice-commodore of the New York Yacht Club, James Gordon Bennett and William P. Douglas, offered to build such a yacht and Mr. A. Cary Smith was commissioned to produce an enlarged Mischief, a “compromise” sloop with a steel hull, no outside keel, lead ballast stowed inside, a centerboard, and a rig partaking of the proportions of the sloop with some of the details of the cutter. This boat was named PRISCILLA, and great things were expected of her when she appeared in New York waters in the early summer. 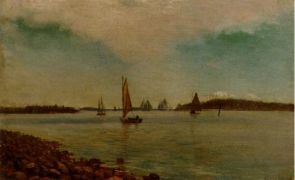 In another field, that of the Sound steamer, Mr. Smith has won the same success as in yachting; the noted steamers RICHARD PECK and the CITY of LOWELL were designed by him after the same system employed in his yacht work, and both have proved their superiority in speed, as well as in economy of running, over the other vessels of their class, all produced after the old rule-o’-thumb methods. METEOR III was built in 1902 for Germany's Kaiser Wilhelm by Townsend & Downey at their boatworks on Shooters Island, off Bayonne. 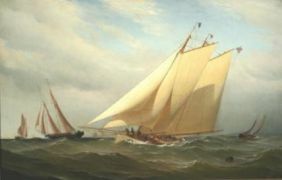 The boat, a gaff topsail schooner designed by Bayonne resident Archibald Cary Smith, had an imperial bedroom suite and a dining room that seated 24. Archibald Cary Smith died of kidney disease after a four weeks’ illness at his home, 51 West Forty-eighth Street, Bayonne, N. J. Mr. Smith was a member of the American Society of Naval Architects and Marine Engineers, of the New York Yacht Club and the Larchmont Yacht Club. His wife died four years ago. He leaves a daughter, Mrs. Virginia K. Smith Hall.